Achieving financial stability and building credibility among the campus community requires establishing goals, conveying consistent messaging, staying firm, and providing transparency, says Randall (Randy) Gentzler, NACUBO Board Chair for 2016–17. Gentzler also values his role as an active mentor who helps to develop opportunities for students and staff, activities that he believes are critical to an individual’s success. 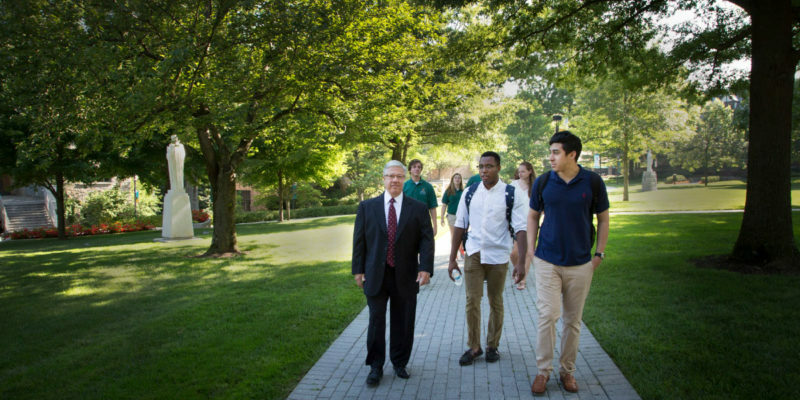 Vice president for finance and treasurer for Loyola University Maryland, Baltimore, Gentzler is dedicated to the role of the chief business officer and to the university’s campus community. His experience and involvement provide a firm foundation for engaging NACUBO’s board members, staff, and membership, while advancing the association’s mission, values, and core principles. As an accounting major in college, Randy Gentzler knew that one of his options after graduation was to work for one of the then Big Eight accounting firms. However, after doing an internship in a public accounting firm during his junior year, he sought a different path—a career in higher education and nonprofit organizations. 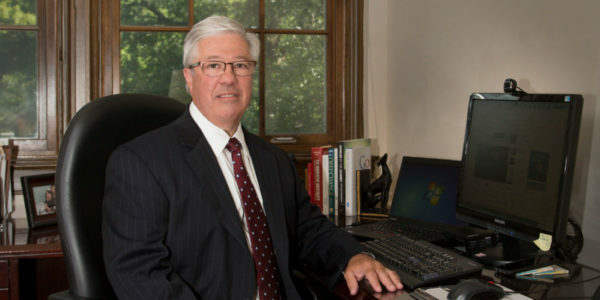 Gentzler, who earned a master’s degree in business administration from Philadelphia University, was attracted to the higher education business office—and later to the position of chief business officer—because it showed promise for an opportunity to do something different every day, rather than repeating typical accounting tasks with little variety. Now CBO of Loyola University Maryland, in Baltimore, he oversees everything from finance and accounting, human resources and technology, to dining services, emergency management, and much more. Gentzler provides leadership to not only his staff, he also actively engages the students by talking with them when they arrive on move-in day and throughout the year on campus. As a former student employee at Elizabethtown College, he understands the importance of getting students involved and taking an interest in their career goals. He recalls that during his senior year, a chief business officer came to his advanced accounting class and said that the business office was looking to hire interns; the job would pay for the remainder of the student’s education and offer a permanent position after graduation. Gentzler took the internship opportunity and decided to stay on for an additional year, serving in a junior accountant position. As an intern in the business office, Gentzler gained exposure to the world of higher education business administration and the many functions of the business office. His responsibilities included managing student accounts, tagging fixed assets, completing bank reconciliations, working on student payroll, and handling other professional duties. These experiences further developed his interest in the higher education industry. But, he still credits his career path in higher education to the CFO who came to his class to talk about internships—and has sought to present such opportunities to the many students with whom he has interacted on the various campuses where he has worked. Many of the senior finance staff whom he has supported have gone on to become CFOs at other universities. 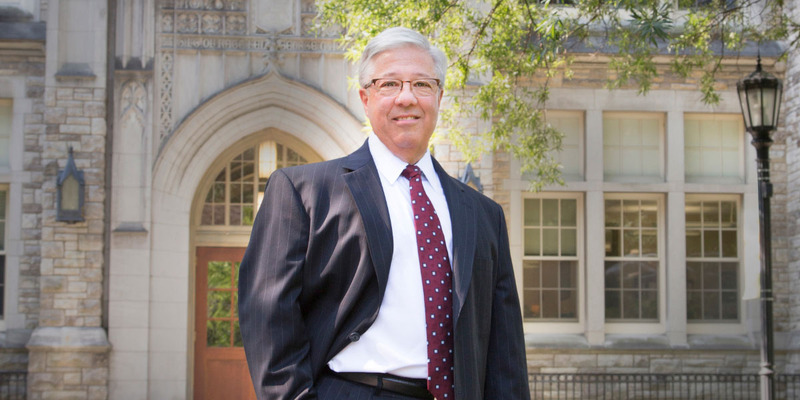 While Gentzler did spend a few years in other industries, he has spent the majority of his 38-year career in higher education. With a deep passion for the field, he considers it particularly rewarding to work in an industry that is so important to students’ futures and to the advancement of education in our country. A strong believer in communication and mentorship, Gentzler explains that two key components of being an effective CBO are interacting with the campus community and staying current on financial operations and best practices. In an interview with Business Officer, he shares his insights on the ever-changing role of the CBO and his plans as NACUBO’s Board Chair for 2016–17. As an undergraduate student, you were intrigued by what the university CFO had to say about working at the institution. What was it that interested you so much? I liked the diversification in the areas of responsibility. In public accounting, when you first start, you’re doing essentially the same thing every day, or if at a small firm, doing a lot of tax return preparation. You’re often reviewing the work of others, especially if you serve in an audit function. It was more appealing and interesting to me because of the broader span of responsibilities and everything that you could be involved in on campus. And, sitting on the stage at graduation and seeing students receive their degrees is very rewarding to me, knowing that in some way I was able to contribute to the experiences, which students gained at my university. Reflecting back on your experience as a student staff member and what the CFO did by coming into your class to promote his profession, what approaches might we have in our current offices to plant the seed that higher education administration in the finance area is a viable career for students who are currently enrolled in our colleges and universities? We can do a better job on campus of promoting the profession, by getting students involved, developing opportunities within our operation to hire them as student employees, and helping them understand the roles and responsibilities in the business office. I work closely with finance students in Loyola’s Sellinger School of Business and Management. For example, the Student-Managed Sellinger Applied Portfolio Fund (“SAP Fund”) was established to provide students with actual portfolio management experience exposure, including asset valuation, constraint setting, asset allocation, asset selection, risk management, and performance evaluation. Each year the university provides the SAP Fund with $500,000 to invest. These funds are a component of the university’s endowment. Students work with a finance faculty member and make the buy-sell decisions for those endowment funds. They might call me and say that they want to sell 500 shares of certain stock. This is only after they have done all the research analysis and due diligence to support their buy and sell decision. During the past several years, the overall equity market has been strong and produced good returns. The finance students, who focus only on domestic equities, have actually, in some periods, generated higher returns than the overall return on our endowment. We also invite several students from this class to attend the investment committee meetings with the board of trustees, during which they often have the opportunity to participate in active ways. For example, if we’re doing a manager search, we might invite two or three managers into a presentation with the investment committee. Students sit at the table, with the managers and trustees reviewing the materials and handouts, and the trustees encourage them to give their opinions and thoughts. It’s one way of engaging them and letting them see exactly what we do in the investment area of higher education finance. This involvement gives them exposure to the real world of endowment investment management, which we hope will build their knowledge and enthusiasm. And whether or not their first job is in higher education, the experience can create enough of an appetite that, later in their careers, after they’ve gotten other experience, they might come back and pursue opportunities in this sector. What inspired you to create these options for students, and how do you communicate the opportunities? A lot of schools do this. It’s not only a way of getting students engaged, but also a way of promoting and marketing the richness of your academic programs at the university. Along with other senior administrators, I attend the on-campus breakfasts for prospective first-year students who have been accepted but haven’t necessarily made a deposit or a firm decision to come here. I take the opportunity to explain our finance student investment program and how participation raises the bar on the level of intensity and the research that students do—and its value as a real-life experience, not a hypothetical one, enhancing their overall educational experience. Looking at your career trajectory, you were promoted within several institutions, and we know that within higher education that’s not standard for high-level positions. Explain how that happened and the advice you might give to people who are currently in midlevel management and looking to move up within their organizations. You first need to develop an understanding of the different types of institutions. The professional career track that you take if you prefer to stay in a small, private institution may be different than one you might experience in a larger public or research university setting. At small, private institutions, there are only so many positions within the financial department. It’s likely that if you have a goal to become a CFO/CBO, you will have to be flexible with regard to job change. You may need to go to another college or university in order to advance into a higher position, as you move your way forward in your professional career path. On the other hand, larger institutions have much larger operations, which increase the number of internal positions and related opportunities for promotion. Working at a small, private institution, I knew that I had to make changes among institutions in order to advance my career. When I left Elizabethtown College, Elizabethtown, Pa., as business manager, I went to Philadelphia University as controller. I left there after five years, but later had the opportunity to return as assistant vice president. Three years after my return, Tom Kingston—the university’s CFO at the time—left to go to Franklin & Marshall College. During my tenure as AVP, I built credibility with the trustees, president, and senior management through the work that I did; I learned very early on from my father that a successful work ethic means you arrive early and stay late, you do what it takes to get the job done right. I took very seriously my work ethic and focused on what I needed to do throughout my career, so that made it easier for me to be considered for that position and other positions as the opportunity arose. The sequence of events happened unexpectedly, but I always knew where I wanted to go, and I moved in order to advance myself in that direction. How have mentors played into your professional career? And what advice would you give others in terms of what to look for and how to benefit from a mentor? First, it is very important to your professional success to have a mentor. You really need to focus on individuals for whom you have a lot of respect and who have made significant accomplishments within their own career. I worked with Tom Kingston for five years, as business manager at Elizabethtown College. We immediately hit it off with respect to our synergies and the way we worked together. He encouraged me to go back to school for my MBA, which would better position me for the next move in my career, especially if I wanted to remain in higher education. He was somebody who supported me and we had a great working relationship. To this day, even though we have not worked together for many years, we still have a very close friendship and get together for dinner quite often. I just really enjoy and respect him as a person and as a mentor. When thinking about mentorship, it’s important that you align yourself with a mentor who has similar experiences or career goals. NACUBO and EACUBO are launching mentoring programs that will provide opportunities to do that. In my own role as a mentor, I’ve mentored three assistant vice presidents, at institutions where I have worked, who have eventually gone on to become CFO; one is actually serving as an interim president. I’ve been one of their strongest supporters in helping them succeed and move to that next position, and it gives me great pleasure and pride to see them sitting in that CBO seat. It’s also important for CFOs to keep in mind that, even if it means that employees may need to move to other institutions in order to move ahead, we should support them in reaching their goals. You can’t look at it selfishly. You have to realize that there will be times when you’re going to lose good people, but understand that it is supporting them in reaching their professional goals and supporting the overall higher education industry as well. Is there anything mentees should not do because it could hamper their success? My philosophy is that you cannot be risk-averse. If you are going to operate with a leadership mindset, you will be taking on some level of risk, where the outcomes will not always be as successful as you would like. Unsuccessful outcomes or mistakes will occur, but you should use them as learning experiences. Where I try to help is by discussing what happened and how it might have been approached differently—asking individuals to consider ways that they might have further researched a decision or what type of data might have helped to reach a different conclusion about the decision made. It’s about not being afraid to take risks and being entrepreneurial in their thinking, because you have to do that in order to bring about successful and productive change. Financial well-being is a real focus for you in more ways than achieving a balanced budget. What are your approaches to and philosophies about institutions maintaining financial well-being? You have to establish goals, stay focused, and convey consistent messaging. You also have to remain firm. For example, at Loyola, I’ve worked with the budget committee, which is part of the governance structure, to implement sustainable practices and strengthen the budget and the overall financial underpinning of the university. When I arrived we were not budgeting for funded depreciation. Consequently, we were not budgeting on a GAAP basis nor providing the financial resources required to be good stewards of our facilities by effectively addressing deferred maintenance. So we implemented a strategy in which we added $1.5 million a year to our annual budget, until we could reach an amount equal to our annual depreciation expense. Communicating that goal and getting that line item funded in your budget starts competing with expenses for other initiatives, including compensation adjustments. You have to be transparent, patient, and deliver a consistent message as to why a goal is an institutional priority. As subsequent decisions and conversations come up over the years, having established the university’s position by communicating and establishing an understanding of the goals early on allows for better support of your initiative. There will always be trade-offs and changing priorities. If there’s a plan to strengthen the financial underpinning of our balance sheet, that gives us flexibility from a debt and operational capacity standpoint, and places us in a better position to invest in the strategic initiatives of the university, we need to continue communicating that and remain consistent with the message. Sharing financial information and providing transparency also improves understanding of overarching issues and the way they impact the goal that you’re trying to achieve. Loyola operates with a great deal of transparency, with a very strong governance model. That goes a long way in building up confidence and respect among the campus community. NACUBO is working on the Economic Models Project to illustrate the current state of higher education and set a vision for what future business models might look like. What are your thoughts on how institutions can pursue their missions, while dealing with economic challenges? Higher education is definitely facing challenging times. From access and affordability to changing demographics, these issues are placing additional pressures on institutions to remain in a financially sustainable position. We need to look for efficient delivery and operating models, if we’re going to continue to remain viable and continue to deliver a quality education. We also need to pay attention to the students, who are our consumers: what are their changing needs and what are their expectations with regard to the educational delivery models? It’s really about developing a strategy at each individual institution that fits with its mission. We need to consider going forward how to do business differently so that we can invest in the future and invest in the strategic initiatives that will continue to make each institution better and remain competitive. One of your major accomplishments has been achieving balanced budgets at institutions where you have worked. How did you do it, what is your advice to others, and what collaborations with senior leaders were important to effective budgeting? This is another communication issue. You can’t simply say, “We need to cut budgets.” The campus community needs to understand why. Do you have declining undergraduate or graduate enrollments? Are financial aid costs increasing? Are there capital and deferred maintenance issues? Stakeholders need to understand what it is that is placing pressure on the budget. They need to understand, in most cases, that it is likely the external environment that is impacting net tuition revenues, as opposed to something that’s happening internally. Communicating this information helps develop an understanding and appreciation for the impacts that are occurring, and then allows you to work collaboratively toward a strategy to reduce costs in the best way. Across-the-board cuts are not strategic. It’s better to review line-item spending through a structured budget development process. Working with senior leaders, you can look deeper into your operations; consider what you might stop doing and the related opportunities for cost savings. In such a highly labor-intensive industry, we need to make sure that we are staffed properly, and that we’re staffing those functions that make sense. We’re good at adding on, but we’re not so good at taking a look at things we might be able to eliminate. And, I think that is what’s required now and in the future. At Loyola, we’ve done some of this through cost-reduction evaluations. Task forces and working groups of faculty, staff, and students review different areas of the university and identify those in which we might be able to reduce costs, or make recommendations. The result of one of the recommendations, three years ago, was a reduction (to 2 percent) in the percentage the university contributes to our employee retirement plan. This collaborative process became a transparent conversation across the campus community and governance structure, after participants had done their research, examined retirement contributions at other colleges and universities, and developed recommendations. The entire process was very collaborative and resulted in identifying many opportunities for cost reduction. It wasn’t only the senior administration and the CFO saying that we need to make these cuts. What we’ve been talking about, in terms of the CBO role, is that financial acumen is important, but that being strategic and thoughtful is perhaps a more effective form of leadership. What are some other traits and qualities that you’d include here? Being an effective CBO clearly requires a combination of skills. Collaboration at the senior level—including the board of trustees—is critical. When you work closely with the finance or investment committees, you gain a better understanding of members’ interests and goals. Building these relationships is key. For example, Loyola’s president and the board finance committee supported me 100 percent on the funded depreciation initiative, and have helped me accomplish many things that continue to strengthen the financial position of the university, including building up our unrestricted reserves balance, all of which are in our mutual interest for the university. As for the numbers, you need to be a strategic thinker and be able to look at the university as a whole. At the same time, you need to look at the overall operation. For example, in 2012 and 2014, I was able to complete two bond refinancings that saved $100,000 annually on our debt service payment. That cost reduction allowed us to reduce our cost of capital to a very low level and position us well from a debt-to-operation type of ratio. CBOs must understand these kinds of opportunities and strategies that get you where you want to go, operationally. We also renegotiated our lease at one of our major graduate centers and reduced the annual lease payment by several hundred thousand dollars a year, which is significant when you are trying to find ways to balance your budget. So, there are two components: (1) knowing the global, broader issues impacting your institutions and incorporating them into interactions and decisions with the campus community, and (2) also having your hand on the pulse of the financial operation to know where to go to take advantage of opportunities going forward. Describe a difficult challenge you’ve dealt with recently at Loyola. And, based on that challenge, what advice do you have for your NACUBO colleagues on managing something of similar scope? When I arrived at Loyola, the university had experienced more than a decade of significant enrollment growth. It was also a period in which the university, like many other institutions, was able to increase tuition quite significantly. Everyone became accustomed to living on all this new annual revenue. But, by the time I arrived, future budgets models projected that the university would need to generate new revenue sources in order to lower tuition increases or begin to reduce expenses in order to balance its budget. The challenge was to explain why we no longer had the generous budget dollars and margins that we’d had in the past, and finding ways to change that culture of expectation—a culture in which individuals come up with new initiatives and they immediately get funded. That was a rather abrupt change that the economic times thrust upon us, at right about the time I was arriving at Loyola. I had to really work on changing that thinking, and it was a very difficult thing to do. How do you hone your skills in this area of strategic leadership? And how has your long-term involvement with EACUBO helped in your career development? Part of being a strategic leader is intuition and common sense. Certain skills and perspectives come more naturally than others—and some can certainly be developed through experience, professional development, and learning. The leadership mindset is also important. Finding professional development opportunities, working with mentors who can support you or give you guidance, and being persistent are all useful. As far as EACUBO, my work there has given me a deeper understanding of the different types of higher education institutions and the varying issues that institutions deal with—some being similar, some not. But, even where challenges are not similar, I think you can learn about ways leaders are dealing with a problem or an issue, and take away some pieces that can apply to your own institution. Also, the colleagues that you interact with and the networking opportunities are priceless. You build great professional relationships and friendships. We all learn from each other. It’s just been a rewarding experience to be involved and participate, and have exposure to some of the top professionals in our field, not only within the region, but nationally. In your role as EACUBO president, what were some key learning moments, and during your tenure, what were you particularly proud of? My year as president was a very busy year. We rolled out the envisioned future for our organization as part of our strategic plan. It required rethinking our association and how we wanted to function and be relevant going forward, and that also changed our governance structure. We streamlined our committee structure with a setup that we believe is more efficient and more productive. Our overall programming has been enhanced within the association, as a result of developing a leadership professional development strategy and revamping the delivery model on the various programs. We’re now rolling out a number of pilot programs, taking place after my presidency. So far, we’re getting a positive response to the structure and the program content at the annual meeting and annual workshop, and attendance has been growing. I’d like to think that the year of my presidency is the time in which that framework and strategic direction was established, and when the work was put in place to allow what we’re enjoying today as an association and what the leadership continues to roll out and refine. Changing the governance structure with regard to the number of years individuals serve as vice chair and chair, with two-year terms in each of the positions, enhances the continuity and helps to strengthen leadership’s chances to have an impact. The change in the bylaws and governance model, which allows for restructuring of the board and allows us to have non–higher education professionals participate, should also produce a higher performing board that helps advance the EACUBO organization and the experiences of its members. To achieve this kind of transformational change, we needed to understand where we wanted to go, what we wanted our outcomes to be, who we are serving, and what business strategy will transform our association. You’ve spent your entire academic and professional career in the eastern region of the country. What makes that region distinctive, and what has kept you there all this time? Many reasons: family, love of the Northeast and its easy access to major cities, love of the change in seasons. I also find the pace, intensity, and easy access to arts and urban settings to be energizing. The primary driver of where I’ve tried to stay is our family and three children; we’ve wanted to stay within a certain geographic region, as I made my several professional moves. What are your thoughts of your upcoming year as NACUBO Board Chair? What would you like to accomplish? First, I’d like to say that I’m honored and excited about the opportunity of being invited to become chair of NACUBO. I can think of no better career highlight or anything that’s more rewarding than having the opportunity to serve as chair in the coming year. We’re working through the strategic plan development this year, which will be a lot of responsibility—finalizing the plan, rolling it out, and supporting John Walda and the management team in accomplishing these strategic initiatives and priorities. That is going to be something of great interest and significance to me. And, I will look forward to providing support, guiding and participating in the board conversation that will take place, and moving forward to make things happen here at NACUBO, to make it an even better place for our members. Being an effective CBO clearly requires a combination of skills. Collaboration at the senior level—including the board of trustees—is critical. Listen to Randy Gentzler discuss the role of the CBO and strategies for effective leadership, by tuning into NACUBO’s podcast series—CBO Speaks. To listen, go to www.nacubo.org and click on the “Conferences and E-Learning” tab. Family: I have been married for 36 years to my wife, Trudy; we have three children and three grandchildren. Outside interests: I enjoy gardening, traveling, and spending time with my children and grandchildren. Reading you recommend: A Prayer for the City, by Buzz Bissinger (Vintage, 1998); The Other Wes Moore (Spiegel & Grau, 2011); and Against the Gods, The Remarkable Story of Risk (Wiley, 1998). Recent travels: We do family vacations—we enjoy Ocean City, N.J., and Hilton Head Island, S.C.
Trudy and I also did a sabbatical leave while I was at Philadelphia University. We spent six weeks in Europe, and we toured Italy, Paris, and Greece. Part of my responsibility was to visit other colleges and universities to talk about study abroad opportunities and other collaboration initiatives. I spent a lot of time visiting the American University of Rome, American University of Greece, and American University of Paris, to meet with the presidents, tour their facilities, and learn more about their academic programs. It was a once-in-a-lifetime experience. Founded in 1852, Loyola University Maryland is a Jesuit, Catholic university committed to the educational and spiritual traditions of the Society of Jesus and the development of the whole person. At Loyola, this means that the curriculum is rigorous, and faculty expectations are high. 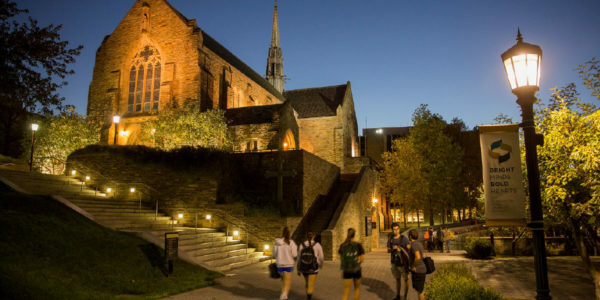 With majors and minors in more than 40 academic fields, Loyola offers an undergraduate program grounded in the liberal arts, focused primarily on developing undergraduate students as well-rounded, global scholars and leaders who are distinctly prepared to succeed in every aspect of their lives. In addition, Loyola offers graduate degrees at the master’s and doctoral levels in a wide range of programs and areas of study. Loyola comprises the School of Education, the Sellinger School of Business and Management, and Loyola College—the university’s college of arts and sciences. Loyola also operates clinical centers in Baltimore and has two graduate centers in Timonium, Md., and Columbia, Md. —RONALD RHAMES, president, Midlands Technical College, Columbia, S.C.